“I want to visit Mt. Hood this winter, but I don’t ski or snowboard. What else is there to do?” That’s a question I hear a lot, either through friends and acquaintances, or as an Ask Oregon Ambassador for the Mt. Hood and Columbia River Gorge region. So just how does a family of four spend a couple of days on the mountain without strapping on a pair of skis or a snowboard? My family recently made the trek up the mountain to answer this question ourselves. Our adventure started by checking into a rental house from Mt. Hood Vacation Rentals. Overlooking the Salmon River in Welches, this would become our “base camp” for the entire weekend. There are many advantages to staying in a vacation home or cabin, especially when traveling with young kids. No worries about disturbing your fellow guest next door (or downstairs), everyone can spread out and have their own space (especially nice for siblings after spending time crammed in a car next to each other), and you have all the comforts of home close at hand. Our house featured a fully-stocked gourmet kitchen with appliances I don’t even have at home, and came in so handy for quick meals on the go between activities. 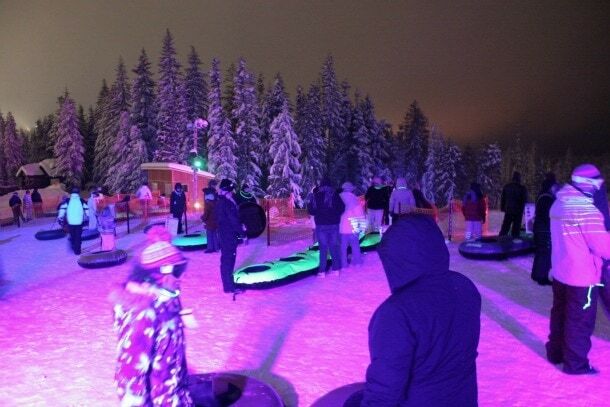 Speaking of activities, our first of the weekend was “Cosmic Tubing” at Skibowl East. What is Cosmic Tubing, you ask? Think of it as a dance party on the slopes: music blasting with colors flashing and laser lights reflecting off the snow, with an easy ride up a conveyer lift to the top of the hill. Skibowl is the only place in the Northwest to offer this, and you can join in on Friday and Saturday nights throughout ski season with either full (five-hour) or three-hour session options. Tubing truly is a family activity, suitable for people of all fitness levels. With double, triple, and even quadruple tubes provided, siblings, parent and child, or even our whole family could ride down the hill together. For the times my six-year-old, Odessa, did take a turn by herself, there was always a friendly and helpful attendant to assist her with either a push at the top of the hill or to get out of her tube at the bottom. A special shout out to Trevor, who laughed and smiled with her after every run, and always extended a helping hand. “May I help you Miss Odessa? Was that fun Miss Odessa? May I take your tube Miss Odessa?” I think she even felt a bit like a snow princess by the end of the night. We went with the full session option (6 p.m. to 11 p.m.). I thought this might end up being too much, especially for my littlest one, but I could barely tear either of my kids from the tubing hill at the end of the night. (The fact near-blizzard conditions had dumped over a foot of new powder didn’t hurt the situation either.) We were not even buckled up and out of the parking lot before they were asking when we could go back. Another visit is already being planned, because both my husband and I had a blast as well. After a late night of snow play, we returned to the vacation rental on the river. 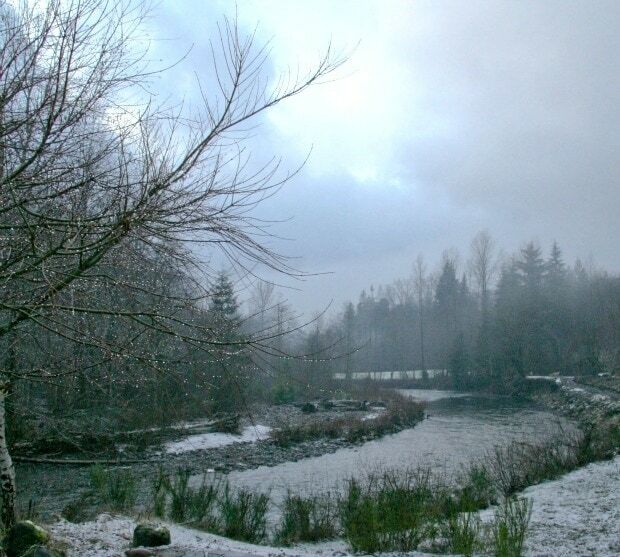 The kids snuggled up in their beds and watched a movie in their room; my husband and I took a soak in the hot tub and then relaxed in front of a roaring fire, with the sound of the Salmon River rushing past outside. After breakfast the next morning, we headed “up the hill” (as the locals refer to it) for more fun in the snow. Our first stop was Mt. Hood Adventure, located in the heart of the village of Government Camp. While they offer guided snowmobile and snowshoe tours (and sleigh rides through the village during the holiday season), we opted to choose our own adventure and left with a pair of snowshoes and poles for each member of the family. At $10 for adults and $5 for kids, it’s a bargain price for a full day of snow play, and not bad exercise either. Mother Nature had blessed us with a bright blue, almost cloudless sky. 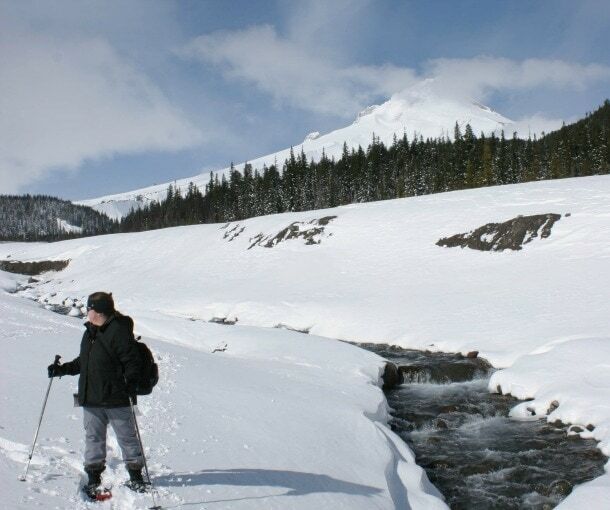 While we had originally intended to join the free ranger-led walk at Trillium Lake (which happens every Sunday at noon), once we were back on the highway, we opted to head towards White River Sno-Park instead for the views of Mt Hood. It would have been a shame to miss them on such a clear day. 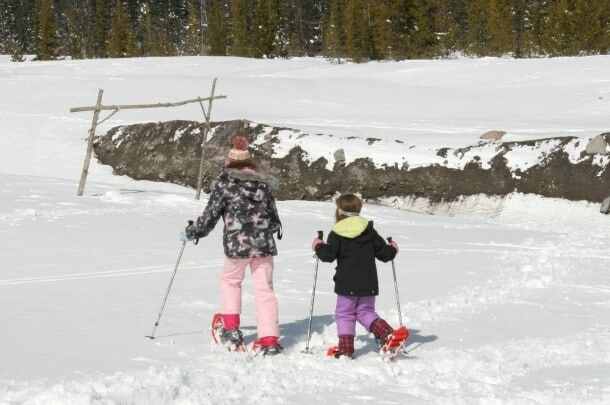 I am not sure why, but I have always thought of snowshoeing as an adult activity, much like most adults think sledding is something only kids do. (Of course, the latter was proven wrong the night before during Cosmic Tubing.) In fact, the kids seemed less than thrilled with going for a walk once we arrived at White River and saw the gaggle of kids sliding down the hill there. After a little convincing, and strapping on their snowshoes, we headed out for a hike up the river canyon. It didn’t take long and the kids realized their initial trepidation was unfounded. Thanks to the snowshoes and poles, we were able to play in deep powder, walk along the banks of the gurgling river, and have a snowball fight (or two) away from the groups of people sledding. My husband, Jon, and I were amazed at how easily they took to snowshoeing; it was very natural, with no tripping and no falling — at least not by accident! Since the weather was so unseasonably warm, we decided the only acceptable option for an after-adventure lunch was the Huckleberry Inn. Also located in Government Camp, they serve up typical diner fare — but what isn’t so typical is their legendary huckleberry milkshakes, a treat we all enjoyed with lunch after working up a sweat on the snowshoe trail. After lunch, we took a stroll down the main drag in “Govy,” passing ski shops, more restaurants, and a lot of happy people enjoying their day on the mountain. We reluctantly returned our snowshoes, a sign that our weekend of snow play had come to an end all too soon. Sage, my tween (who normally thinks that spending an entire weekend with her parents and little sister is far from cool) begged, “Can we stay just one more night, Mom? Pleeaaassseee!!!!!! !” She summed up everyone’s thoughts exactly! Have questions about my trip? Want to plan your own? Just Ask Oregon! I am here to help! Know before you go: Sno-Park permits are required for parking at Skibowl, the entire village of Government Camp, and other winter recreation areas through April 30th. They are available locally at most retail outlets, ski rental and equipment shops, gas stations, and even restaurants. Note: Lodging and activities were provided at no charge. This in no way affected my opinions (or what a good time we had) of our activities over the weekend.